Ever lose track of time when getting a meal on the table? I mean time in the sense of how long it takes pasta to cook, a vegetable to steam or a casserole to brown lightly in the oven. This can be tricky when cooking more than one dish at a time, especially ones that must be watched carefully. It can also make cooking a complete meal seem overwhelming. Salvation from kitchen stress can come from something as ancient and low-tech as my dad's darkroom timer from the 1940s. It’s all about getting into the timer-setting habit. I started a few years ago after reading how Julia Child would have bells, whistles and gongs going off all over the kitchen to help her keep tabs on things. 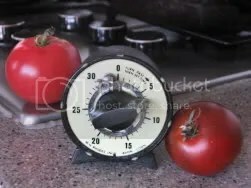 I can’t handle more than one signal at a time, so I use only my stove’s timer, with my dad’s old darkroom timer handy for backup. Now that I am in the habit, however, I can readily agree on the value of this simple solution. So don’t tax your poor head any more than it already is. Set a timer for each dish that needs close attention and breeze successfully through the kind of multi-tasking that routinely takes place in a kitchen. You’ll be right on top of the steaming vegetables and know just when the casserole is browned and ready for the table.